We are excited to welcome Bedfinder to our growing TopPlace™ family! Now it is even easier to pick a hotel in the most suitable location! Accurate and unbiased location context on Bedfinder is now powered by TopPlace™ Location Score Elements. Bedfinder.com is an online booking agency providing accommodation for leisure and business travels. Headquartered in Zurich, Switzerland, their portfolio includes more than 100.000 hotels worldwide. The parent company, Hotelplan Group, is the leading Swiss tour operator with more than 80 years of experience and belongs to the Federation of Migros Cooperatives. What is a Location Score Element? Bedfinder is using TopPlace™Location Score Elements. But what are Location Score Elements you may ask? A Location Score Element as featured on one of the hotel listings on Bedfinder. TopPlace™ Location Score Elements provide a series of location rating scores and short descriptions for every single hotel or apartment in the world. 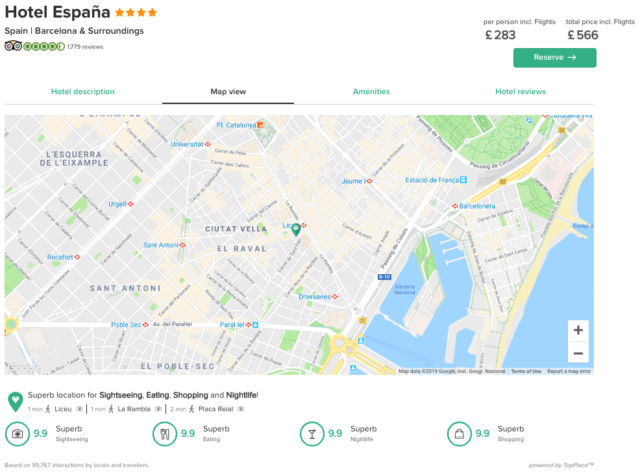 Displayed on the hotels’ or vacation rentals’ list page, they help visitors understand the location context and attractiveness very quickly. This allows visitors to find the best option without interrupting the search process, instead of leaving the site to do further research about the location. Each category has a top rating of 10. Each rating also has a textual description, such as “Superb for Sightseeing” or “Good for Shopping”. A Location Score Element can also include top rated nearby Points Of Interest (POIs). The exact layout and options are based on the template selected. The feature helps users of OTA and Metasearch sites to understand what’s the hotel location like quickly and easily. However, one question we are frequently asked is how to ensure the Location Score Element fits with the look and feel of a site? Within the admin wizard, there are a number of different preferences available. However, for things like font type and exact color matching, the answer is simple. The style is easily customizable through the CSS! If you like what you see, feel free to sign up or reach out to one of our team who will be happy to help. We look forward to having more travel companies join our platform.